A group of British lawmakers has strongly criticized the intervention by Britain and France in 2011 that led to the ouster of Libyan leader Moammar Gadhafi. The report from the British Parliament's Foreign Affairs Select Committee said a lack of planning for the aftermath meant that Libya quickly descended into chaos, with rival militias battling for power, and the terror group Islamic State gaining an increasing foothold in the country. In Washington, the State Department echoed that the power vacuum facilitated the disorder that followed the fall of Gadhafi. “We recognize that in the immediate aftermath of Gadhafi's downfall, not enough was done to secure Libya and to help the new government stand on its feet,” State Department deputy spokesman Mark Toner said Thursday. But Toner said since that time, there has been a focus on setting up the new Government of National Accord and helping it cope with threats from Islamic State. The damning British verdict came exactly five years after then-British Prime Minister David Cameron and then-French President Nicolas Sarkozy stood triumphant in Benghazi's Liberty Square in September 2011, cheered by huge crowds. 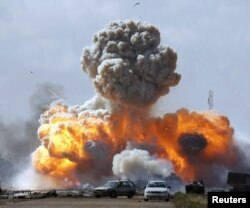 Their joint campaign of air and missile strikes had swiftly ousted dictator Gadhafi. The Libyan leader had threatened to attack the rebel-held city of Benghazi. The report, however, concluded that Britain and France had failed to identify that the threat to civilians was overstated. Vehicles belonging to forces loyal to Libyan leader Moammar Gadhafi explode after an airstrike by coalition forces, along a road between Benghazi and, March 20, 2011. "The decision-makers here were being presented with a blood-curdling assessment as to what was going to happen in Benghazi and therefore the need to act,” said lawmaker Crispin Blunt, chairman of the committee. He added that past failures by the international community led to a rushed decision. “Overhanging that was the history of Srebrenica and the failure of the international community to protect the people of Srebrenica back in 1995, and it was in that climate that decisions were taken,” Blunt said. He was referring to the massacre of 8,000 Muslim men and boys in 1995 during the Bosnian war. They were slain when troops commanded by a Serbian general overran the U.N. enclave protected by Dutch troops. It was the worst mass killing in Europe since World War II. The report by the Foreign Affairs Select Committee regarding Libya said the initial aim of protecting civilians drifted into regime change. That was one of the earliest mistakes that the British-French coalition made, said analyst Riccardo Fabiani of the Eurasia Group. 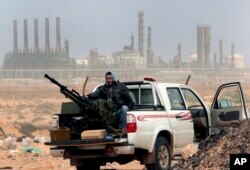 FILE - An anti-government rebel sits with an anti-aircraft weapon in front an oil refinery in Ras Lanouf, eastern Libya, March 5, 2011. The British government was also criticized for failing to understand the nature of the rebellion. Fabiani said the chaos could have been predicted. 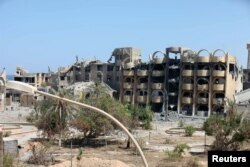 Heavily damaged buildings are seen after they were captured by Libyan forces allied with the U.N.-backed government following a battle with Islamic State militants in Sirte, Sept. 7, 2016. Cameron has since defended his action, and the British government says the military action was requested by the Arab League and approved by the U.N. Security Council. Chaos continues on the ground in Libya. Two rival administrations — one backed by the U.N. and based in Tripoli, the other in the eastern city of Tobruk — signed a unity government deal in December, but there’s been little progress in enforcing it. The lawlessness has allowed Libya to become the main gateway for migrants trying to reach Europe. More than 125,000 people have attempted the crossing this year alone; an estimated 3,000 of them have drowned.